Sara Frankl knew she had a terminal disease, but she didn't let it stop her from living. In the face of immeasurable pain, Sara chose joy--again and again. Her unforgettable message of hope and purpose lives on, even after her death, in her words. CHOOSE JOY is a compilation of the lessons Sara learned while she was dying, written in her own words and sewn together by her close friend Mary Carver. It is a reminder to see the beauty in life, even when it looks nothing like you hoped or planned. 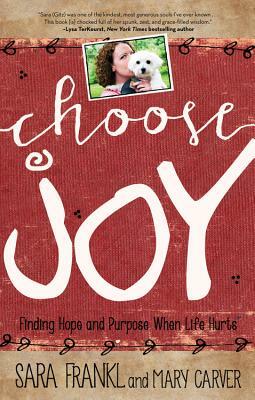 In a world full of tragedy, choosing joy is no small task--but, as Sara knew, the importance lies in the choosing. Once you learn to make that choice, every day, no matter what happens, joy will come. SARA FRANKL died in 2011 at the age of 38. Her last few years were spent blogging about her illness (a.k.a. GitzenGirl), keeping journals and correspondence, and painting. Her blog's cumulative total was eventually 2,000,000 unique visitors a month and still averages over 20,000 monthly. MARY CARVER is a writer of a personal blog, Giving Up on Perfect, and has been published in several blogs and magazines. Mary lives with her husband and two daughters in Kansas City.